The Puggaree (cloth band around the hat) can be seen on this Australian Army Slouch Hat with Royal Australian Engineers corps badge. The Slouch Hat is arguably one of the more distinctive pieces of Australian Army uniform. Most Australians easily recognise the upturned brim and the rising sun badge to be synonymous to the Australian diggers. However what is not as commonly known is that the Slouch Hat is incomplete without the Puggaree, the cloth band that goes around the hat (as shown by itself in the picture on the right). Even less commonly known are the origins of the word Puggaree. If you ever asked a Sikh man or woman to point to their Puggaree, he/she would, without hesitation, point to the turban on their head. This is because the word Puggaree is, in fact, the Punjabi/Hindi word for turban. Most Sikhs originate from Punjab (literally: the Land of Five Rivers). The Sikh identity is rooted in part in the observance and maintenance of five articles of faith. These are namely, Kes (uncut hair), Kurraa (iron/steel band around the wrist), Kungaa (wooden comb), Kucchayraa (prescribed undershorts) and Kirpaan (traditional dagger shaped object). Principally, Sikhs wear the Dustaar/Puggaree (Turban) as a head covering for their unshorn hair. These unique external attributes are an assertion of the social and political sovereignty of the Sikh identity. They are a major part of the Sikh pysche and resonate with the Sikh values of realising nobility and divinity within each individual. Due to its definitive importance and significant religious ideals, the Puggaree is tied layer by layer and is not put on or taken off like a hat. The Puggaree is a respectful part of the Sikh identity and to ask for it to be removed can be perceived as being disrespectful and demeaning. For most Sikhs it is also considered disrespectful to place a hat or helmet over the Puggaree, and at times practically impossible due to its physical nature. So how is it that the Australian Army, to this day, wear upon their slouch hats a coloured cotton band called a "Puggaree"? The Puggaree connection appears to go back to the British - Indian interaction during the British occupation of India. The Sikhs served as the backbone of the British Indian Army with some officers becoming so well acquainted with their "native" troops that they, at times, even chose to dress like them (out of interest or necessity). It would appear that this tradition of wearing a Puggaree continued on (albeit in a symbolic manner) even after the British-Sikh connection was somewhat tested after India gained independence and Pakistan was formed in 1947 (resulting in the separation of the Sikh homeland of Punjab). As we look through Australian newspapers of the previous century, we see many mentions of the Puggaree in the Sikh context. 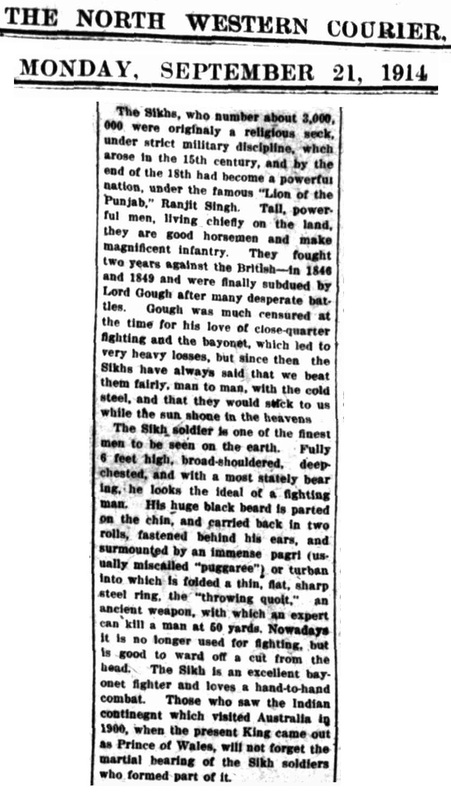 Some of these references are to incidents on the battlefront in World War 1 as per the following newspaper article on Lietenant John Smyth of the 15th Ludhiana Sikhs role in the Battle of Festubert (contained in 'The Chronicle', Adelaide, 8 January 1916). "Lieutenant Smyth and ten Sikhs set out with two cases of bombs to relive a British trench that was in great peril. Pulling and pushing the boxes, they wriggled their way over ground devoid of all cover. After one hundred yards only seven men were left; a little later, meeting an increased blast of the enemy's fire, there were only two - Lieutenant Smyth and Sepoy Lal Singh. One box had to be abandoned, but they hauled the other across a stream and reached the trench, both untouched, their clothes riddled with bullet holes. Shortly afterwards, Sepoy Lal Singh was killed. Only the lieutenant remained of the valiant eleven, and he has been awarded the Victoria Cross." Lance-Naik Mangal Singh received the Second Class Indian Order of Merit, while the Indian Distinguished Service Medal was conferred on all the above sepoys. The Puggaree is also referenced in the article accompanying the cut out toy soldiers. You are able to download these for colouring in purposes by clicking on the picture below.